So, if you have watched the news or gone on the internet lately, you probably know it is pretty cold in the midwest right now. We are talking car-battery-dead cold. We are talking toes-going-numb-while-you-jump-your-car cold. We are talking roads-made-of-pure-ice cold. This is hibernation weather, people. 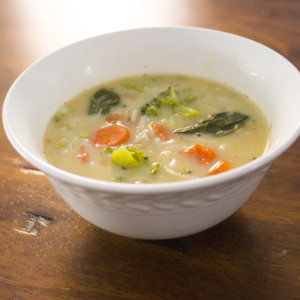 To me, soup and hibernation go hand-in-hand. But this kind of cold calls for a special kind of soup– something creamy and spicy. Something to warm your frozen fingers, toes and noses. Something filled with immune boosting garlic and ginger! Thankfully this recipe delivers in a big way. 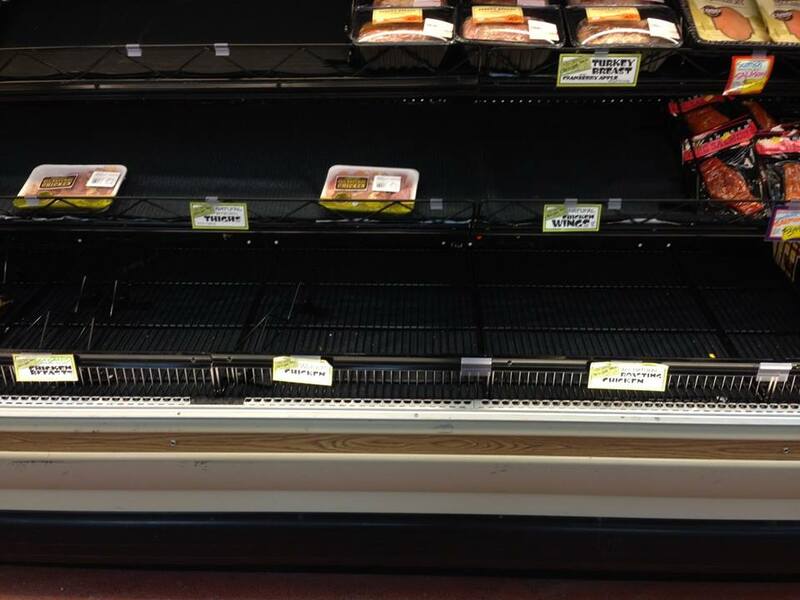 Desolation where the spinach and red peppers should be. A mausoleum where there once was a meat department. Thank goodness they still had plenty of wine. 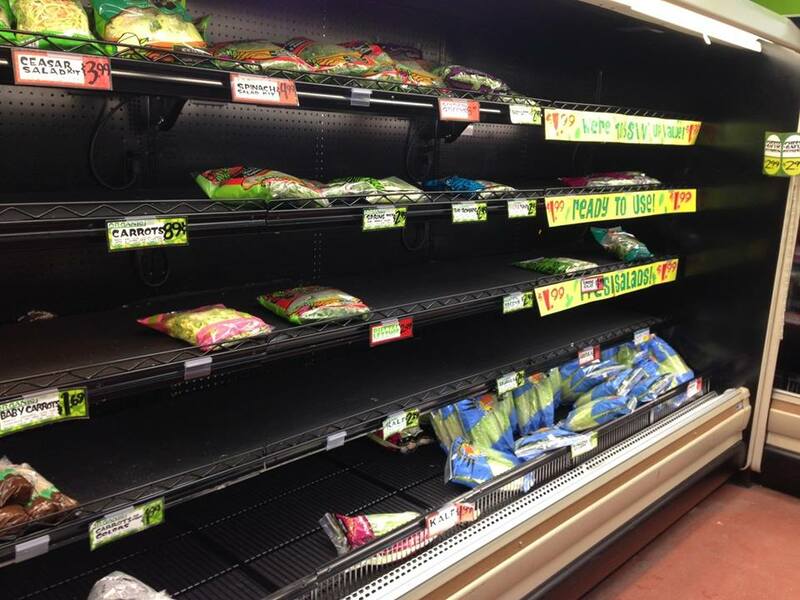 The delivery truck had failed to make it because of the snow, which combined with the Snowpacalypse fears gripping the hearts of many like a ghost of Y2K, meant Trader Joe’s had been cleared out. I arrived just in time to get my hands on the very last package of organic, free-range chicken in the entire store: a pack of five drumsticks. My plans quickly changed, and I am glad they did. Baby bok choi and carrots replaced red pepper and spinach. Drumsticks replaced breasts. That ended up being a bit more work intensive, but the bones really enhanced the flavor of the broth, so it all worked out in the end. Obviously, this recipe is versatile and pretty simple. Feel free to off-road with ingredients according to what you have on hand. 1) In a large, heavy bottomed pot heat coconut oil over medium-high heat. Add garlic and ginger and sauté for a minute or two. Add chicken. Lightly brown on all sides, about a minute for each. 2) Add broth, water, lemongrass, kaffir lime, fish sauce, coconut milk and 1/4 tsp cayenne. Bring to a boil and simmer for 30-40 minutes, or until the meat easily separates from the bones. 3) Remove drumsticks from soup and place on plate. Using 2 forks separate and shred the meat, and place it back in the soup. Discard the bones. If you are a bone broth maker, pop the bones in a plastic bag once they cool and put them in the freezer for your next batch of broth. 4) Add in the bok choi and carrots. Simmer for another 15 minutes. Adjust spiciness to taste, adding cayenne a little bit at a time until you find the perfect spice level for you. Remove from heat. 5) Over time the rice noodles get pretty mushy if you add them directly into the soup. A better method is to place a small fistful of noodles into bowls for serving. Ladle the soup over the noodles, stir, and allow to sit for 2-3 minutes. Stir again.